Photo source: User kamshots on flickr. I used to think texting was something that teens did: a form of instant messaging to gossip, coordinate meet-ups and talk about cute boys (or girls). Nowadays, however, I find myself using texting as a primary form of communication with my peers – I’m talking folks, like me, in their 40’s. It’s also prevalent in the business world, from the meeting room to the board room. With each subsequent text incurring an overage fee, I decided to stop texting until the start of the next billing cycle. But lo and behold, it couldn’t be stopped! Friends and family continued to text me. And I had to reply to them the old fashioned way: email. Let’s consider how (and why) texting has taken over the world. Consider the phone call. You dial your friend. She hears the ring and has to be available to answer it. She answers and you talk. What if you simply needed to tell her that you’re running 10 minutes late? Does that really require the dial-answer-communicate cycle? Or how about a text that says “Running late. Be there in 10”? Done. I remember receiving text messages on first generation cell phones. The user experience was poor. We’ve moved light years ahead on smartphones. Now, my conversation with each contact has its own “record” and I can see the back-and-forth messaging in one place. It’s like a permanent instant messaging window, holding the entire history of our conversation. Photo source: User oregondot on flickr. 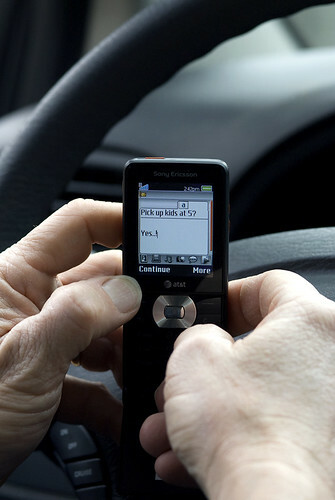 Whether it’s an iPhone, an Android phone or my parents’ 90’s era flip phone, every cell phone supports texting. This is one “application” in which you and your friend don’t need to download the same app. The app is built in to your phone. 4) Its notifications receive valuable screen real-estate. While some may change the notifications settings on their phones, for most of us, an incoming text message receives high “priority.” The message pops up as a notification, usually accompanied by an audio alert. To check email, you have to open your email client. Texts, on the other hand, are visible the moment they come in. 5) It’s great for sharing photos. Texting is Instagram without the filters. Long before Instagram hit the scene, people were sending each other photos via text message. Take a cute photo of your kid? Send it to family via text. As mentioned (above) with “notifications,” family members will see that photo right away. If you sent it via email? They’d probably see it much later. 6) There’s an expectation of near-immediate response. Let’s say you need to urgently reach a colleague and she’s in a meeting. Do you interrupt the meeting and pull her out of it? Do you call her cell phone? Maybe in days past. These days, you send her a text message (perhaps labeled as “URGENT”) and chances are she’ll take the needed action. Immediately. 140 characters or less. It’s a big part of Twitter’s popularity and charm. With text messages, you get an additional 20 characters, for a total of 160! Endless email chains. Friends who just can’t seem to stop talking. With text messages, you get none of that. Instead, it’s 160 characters (or less) and you move on. 8) You can text in groups (if you want). Yes, your 1:1 conversations can be extended to groups of friends (or colleagues). In a work setting, this could be especially useful when traveling together to a conference: coordinating meals, meet-ups and the like. In addition, there are numerous apps available to help you send group text messages on the cheap. 9) It delivers the entire payload at once. During natural disasters, voice service may be down, data service may be down, but text messaging is likely to survive. So your email won’t get through, your web site will be unreachable, but you can still send that text message. I’m sure texting is an important tool used by relief organizations and first responders today – and its use cases are sure to grow. This entry was posted on Monday, February 4th, 2013 at 6:05 AM and is filed under General. You can follow any responses to this entry through the RSS 2.0 feed. You can leave a response, or trackback from your own site.